CommandosFansite.com is part of the TAFN network. Ever since 1997 we've been around to cover the Commandos games, developed by Pyro Studios. With the release of their other game titles, TAFN became a growing network of gaming fansites, expanding beyond the Commandos universe. For more information about our network visit www.tafn.info. If you're still left with questions, please use the contact form. Today is a great day! Today German game developer and publisher Kalypso Media announced they have acquired full rights to the Commandos IP and are planning to further extend the franchise. In short: a new Commandos game is on the horizon! The how, when, where and whatnots are not yet clear. On their Facebook page they say they are right at the beginning of the planning phase, thus cannot say more at this point. They also say they are thoroughly discussing and evaluating possible options when it comes to possible release platforms. UPDATE: Unfortunately Aditya was requested by Pyro Mobile to take down his project. As such his game can no longer be played online. In respect of his work, please do take some to visit his website to see his other works, as he earns a massive amount of respect for the effort he put in recreating our beloved game in HTML5. It’s a shame Pyro Mobile doesn’t share the same love for his talents and somehow uses the created hype to garnish some momentum towards the announcement of Commandos Mobile. Whilst this news is not directly related to the upcoming Commandos Mobile game, we think many of you, who are probably long-time Commandos fans, are still interested in this news. Furthermore it’s time for an update to this page, as Pyro Mobile is still very secretive about any information on Commandos Mobile. Today Aditya made his HTML5 recreation of Commandos: Behind Enemy Lines publicly available. So far the first mission is available to play, but Aditya writes in a blog post that he plans to add more missions in the future (first he needs a well deserved break). Work on the Commandos browser version started about 8 months ago and we have to say it’s really amazing to see what the dedication of a single person to recreate one of history’s finest strategy games can accomplish. If you want to read more about how development of the game progressed, visit Aditya’s blog post about recreating Commandos. To show your love for the game, leave feedback or report a bug you’ve found, please visit Aditya’s Facebook page. But first play Commandos in your browser! 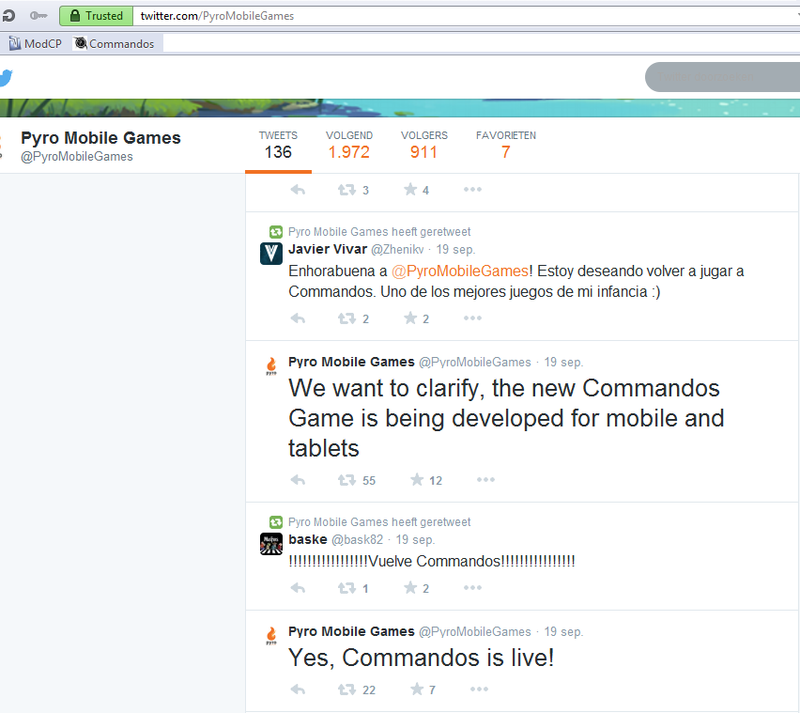 Thanks to our forum member newuser, we can share some new information about Commandos Mobile. Eduardo López Asenjo, business manager at Pyro Mobile, reveals in an interview with U-Tad, that the development of the game is still in its early stages. Commandos Mobile is currently slated for a late 2016 release and will be available for iOS and Android platforms. An interesting detail is that Eduardo talks about the first version of the game. This might suggest that Commandos Mobile will get updates after the initial release in the form of extra missions, challenges and new features. Obviously it’s too early to tell for sure though and moreover, with Commandos Mobile being so early in its development stage, it’s unlikely that Pyro Mobile has made definitive decisions on this matter. If you’d like to read the full interview, you can do so by clicking here. Please note that the interview is in Spanish, so you probably have to run a Google Translate if you’re not a native speaker. The part about Commandos Mobile is in question 6 (the majority of the interview is about Pyro Mobile’s latest game; Supper Soccer Club). We’d like to thank newuser for this valuable information, which he shared with us in our forums. If you have any information yourself, you can notify us by filling out the contact form, or give a heads up in the forums. Hi there soldier and welcome to the semi-revamped CommandosFansite.com! We’ll use this minisite to keep you updated on the upcoming Commandos Mobile game, which is currently in development at Pyro Mobile headquarters. If you’re looking for information about the older Commandos games, you can still access our old website here: www.CommandosFansite.com/content. If you have any intel about Commandos, Pyro Mobile or something else newsworthy please inform us via the contact page! The official site of Pyro Mobile had a makeover, I guess to accompany the release of the new Commandos game. If you’d like to discuss the upcoming Commandos game give this thread at our forums a try. Over on the Eidos forums sp00kythekiller found out that Pyro Mobile Games is working on a new Commandos games. As the company is now Pyro Mobile this of course means that the title is being developed for mobile and tablets. Not looking for Commandos Mobile Game but for the older Commandos games? Click here!